…. 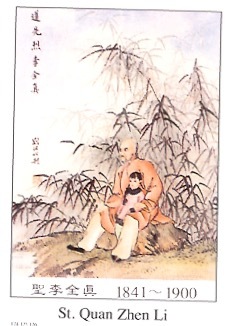 St. Quan Zhen hid with his baby daughter Delian in a reed pit outside the village but was discovered by anti-Catholics…. Rebels tried to force St. Quan Zhen to worship idols, deny the faith and buy his life back with cash. He refused, saying, “We’ve been Catholics for generations. We will never worship strange idols and won’t even discuss denying our faith.” ………St. Quan Zhen was finally dragged to front of the temple and martyred.